Ah! Spring has finally arrived! Today, it was so warm I decided to go to school without wearing my coat. I only had my leather jacket. And it was perfect! I also finished the book I was reading before, Botchan. It was a short yet fun read. 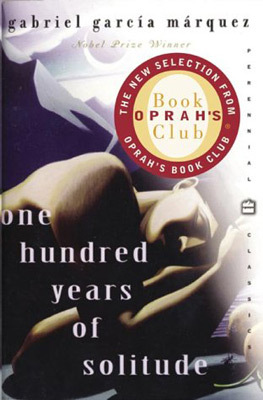 Now, I picked One Hundred Years of Solitude by Gabriel García Márquez. Everyone seems to have read this, so I might as well read it. This afternoon, I watched the second episode of The Amazing Race. My download has finished, and since I had some free time, I decided to watch it. Some commentaries: I am glad that the team that was eliminated today was the team that I thought was going to be eliminated. They just don't have what it takes to race around the world and win a million dollars. On the other hand, I am somehow irritated at the show because they include contestants that are rather weak, such as elderly couples. Although I am not trying to say that I am partial, I think it would just be unfair for the other teams that are stronger to have a weak contestant. There is just less competition. Anyway, I am not the producer of that show, and still, I like watching it, so what can I do? nakakabaliw yang book na yan, pare-pareho ang mga pangalan. pero i still enjoy it. me too, i still dig Amazing race. kahit gabi na yung replay, pinapanood ko pa rin minsan. Aliw tong 100 Years of Solitude. I read it three times and I'm planning to read it again one of these days. Enjoy! I read 100 yrs as well.. It was a jumble figureing out who was who since all the names are the same.. but you get it after the first decade of people. I found the book interesting, but not very enthralling. I could have easily put it down at any point and forgotten about it. I have a need to finish books once started (especially if they are interesting).